Year 2, Week 6: What Does The Fox Say? If you haven't heard, the hottest thing going around YouTube right now it is a silly music video called "The Fox" by a duo named Ylvis. To understand this lunch you have to watch the video. Then watch it again. It is the best three minutes you will spend all day. Don't take it too seriously, it is meant to be a parody and to be stupid and funny. So before you go any further, watch the video below if you haven't already. So my kids are addicted to this video and song. They want to watch it over and over. If you have kids, show them the video, they will love it. Who knew an elephant says "toot?" Inspired by the video, and my kids obsession with it, I present my daughter's lunch for today! This was made in a Planetbox Rover and also includes a note from Lunchbox Love. --Any sort of decorative animal things. I used food picks but you could use stickers, little toys, or anything else you have. Make sure they are animals that are in the song though! 1. Cut the top and bottom off two orange sweet peppers. Cut pointy ears out of the top of each pepper and cut a long rectangular piece out of the bottom. It sounds difficult but just look at the picture above to guide you. These will be your foxes. 2. Cut two pieces of white cheese in "T" shapes to fit on top of the orange peppers to make the white fur. Trim the sides into whiskers if desired. Also cut out two small triangles as ears for each fox. 3. Look at the pictures above to draw the facial features with food coloring. Use food coloring markers or a toothpick and normal food coloring. Assemble the two foxes and place in the main compartment of your container. 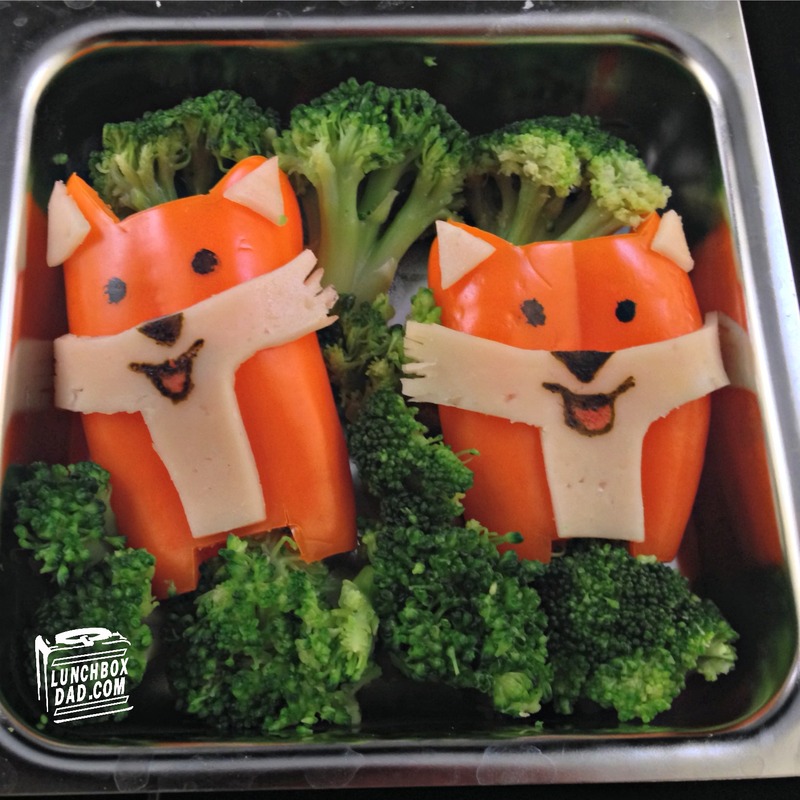 Surround the foxes with broccoli to look like trees in the woods. 4. Fill a side container with grapes (or another fruit your child loves.) Do the same for another side container with protein or fruit. Try and use colors that will complement whatever animal decorations you are using. 5. Arrange a grain in one more container. I used pretzel bites because I had them on hand in an open bag. You might want to choose a whole grain. Decorate the side containers with your animal stuff. 6. Carve the letters out of cheddar cheese. You can pick any of the fox sayings from the song. If you have little letter food cutters that would make it so much easier. I just did them freehand with a sharp knife. 7. I finished off the lunch by using a note from Lunchbox Love. 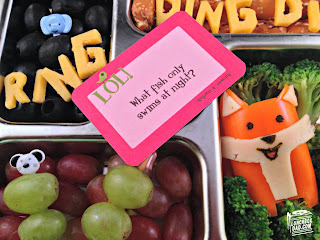 The joke about the fish fit perfectly with the theme! Have fun with this and customize the ingredients to your child's likes. If all else fails just communicate by "morse" with your kid for what they want in their lunch! Hey remember to follow me on Facebook, Twitter, and Pinterest! If you are looking for an easy Halloween meal, check out my recent post for my Ghoulish Graveyard Pasta Dinner! 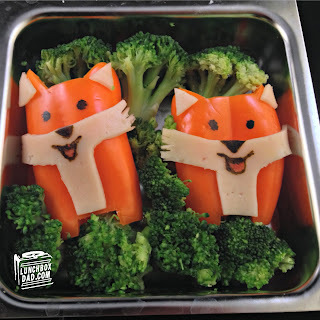 Love it, your sweet pepper foxes are great. 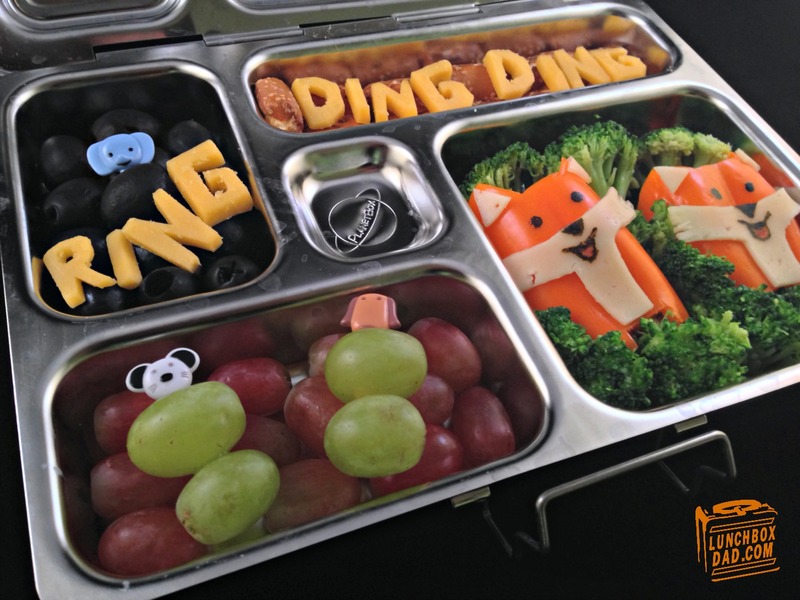 I love the way you're able to come up with so many different sorts of themes for these lunches. I hadn't seen the YouTube video before you mentioned it but have now educated myself :-) Also just Googled the answer to the fish joke too. Thanks, hope I didn't get the song stuck in your head! Awesome. Ring ding ding. You rock. Thanks Arjan, don't get that verse stuck in my head again! I watched the video and my kids would love that....but they might not stop playing it. Very cool lunch. My kids haven't stopped playing it since they first saw it! Probably the weirdest video I've ever seen....yet I still kind of enjoyed it, lol. Love the lunch. Definitely weird, but fun. Thanks! Those foxes are so cute!! This is ridiculous in the best way humanly possible! Bowing down!! Anytime you need a song stuck in your head, just ask me! Oh my gosh, this is hysterical!! 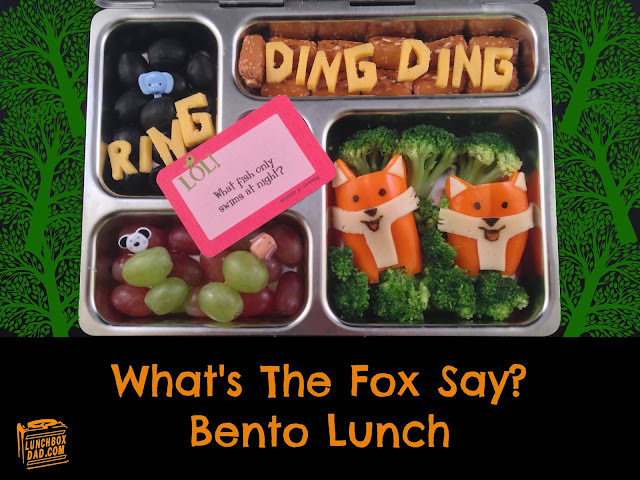 This video is so funny and your bento lunch is awesome! I have a sweatshirt coming for my son that has the song on it! You did fantastic!! Great mom getting your son the sweatshirt, glad you liked the lunch!